“There are no jobs for high school graduates…” So, where do we go from here? Amid heated discussions of employee displacement due to automation and outsourcing, the fact that employers of traditionally low-skill jobs are now placing a premium on college degrees is getting overshadowed. “In our factories, there’s a computer about every 20 or 30 feet,” Eric Spiegel, former president and chief executive of Siemens USA, told the New York Times. “People on the plant floor need to be much more skilled than they were in the past. There are no jobs for high school graduates at Siemens today.” The same goes for John Deere dealerships, where employees are often tasked with fixing tractors and harvesters. The traditional toolbox has been replaced by a computer that requires advanced math, comprehension, and problem-solving skills to operate. As more companies incorporated various technologies into their business models over the years, the need for employees with more sophisticated skills and credentials increased. Now, not only have the jobs themselves evolved, but many companies are using a lack of a bachelor’s degree as a simple way to weed out less-desirable candidates. This means that a lot of factory-floor jobs aren’t going to be open to people without a college diploma, even if those people would be otherwise qualified for them. Pursuing some form of post-secondary education is an obvious route for many, but only 44 percent of high school graduates enroll in a four-year program right after school, and fewer than half of those students will finish their degrees in four years’ time. 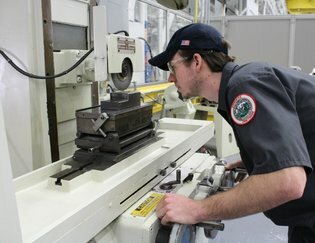 Traditionally, two-year programs and community colleges have been used to bridge the skills gap, but they often end with students getting some kind of generic training or degree that still falls short of employers’ expectations. Rapid changes in our technological landscape are demanding more from human workers because machines are now capable of delivering more, and contrary to what President Trump has said throughout his campaign and into his presidency, members of the working class aren’t losing most of their jobs to offshoring and globalization. In fact, a Ball State University study has concluded that almost nine out of 10 jobs have been lost to automation since 2000. As automated systems continue to improve, this disconnect between the number of workers and the number of jobs they are qualified to fill is only going to grow. The job market in the age of automation is going to get even more competitive, so we need to find better ways to bridge the gap and put more people to work. For employers, bachelor degrees are considered a validation of an applicant’s skill set and propensity to do well in a job. To some degree, they could be right, but experience gained through apprenticeship programs or on-the-job training is also a good way to assess potential. Those options are also a great way for young people to avoid costly student loans or the nerve-wracking process of hunting for a job after graduation. “Apprenticeships can start with a job and end with a Ph.D.,” said Noel Ginsburg, president and founder of Intertech Plastics in Denver. Though it may be an easy way to cut down on the number of applicants for a job, a degree shouldn’t be the only thing employers look for in potential employees. Ultimately, we need to find other ways of judging an applicant’s past performance and suitability for the workplace. Pushing for education is important, but in this era of rapid technological advancement, it has to be combined with human adaptability and initiative, two skills that might prove to be the most valuable characteristics an employee can bring to the job site.